This charming couple, who live in Italy, come to Menton every year especially to dance the tango. 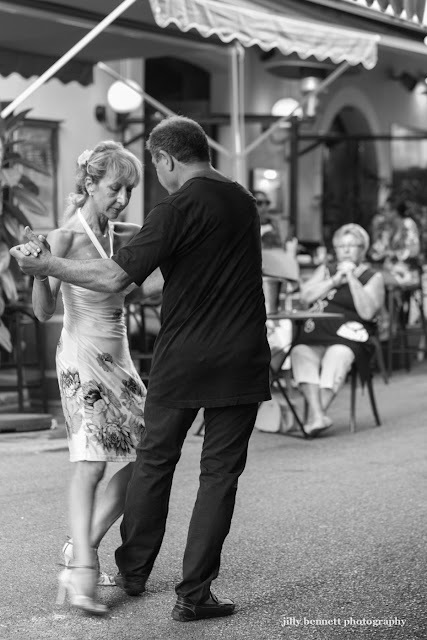 I love to watch them dance - the rapport between them, the love, the concentration, the fun. Sometimes they fall about laughing. Absolutely adorable people and such beautiful dancers too. Ce charmant couple, qui vit en Italie, vient à Menton chaque année surtout pour danser le tango. J'aime les regarder danser - le lien entre eux deux, l'amour, la concentration, le plaisir . Parfois, ils se mettent à rire​​. Ce sont des personnes absolument adorables et de beaux danseurs aussi. My son lives in Buenos Aires. His wife is Argentine. Her parents danced a tango at their wedding. it was magnificent and is a special memory. I would love to watch this. Watching is all I would do. I can't dance like they can.